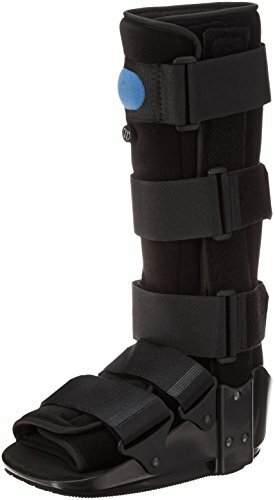 OTC brand (model CMS-003-17) valuline pneumatic high top walker boot. Inflatable Air system that increases stability while also decreasing pain and swelling. Accommodates varying types of swelling patterns. Easily adjusted for desired compression and optimum fit. Indications are soft tissue injuries, grade 2 and 3 sprains, stable fractures, post operative use, trauma and rehab. Pneumatic system increases stability while decreasing pain. Easily adjusted for desired compression and optimum fit. Features a high top upright. Ideal for soft tissue injuries, grade 2 and 3 sprains, stable fractures, post operative use, trauma, and rehab. Measure by shoe size. Available Sizes: Small (Men's 8-9 / Women's 9-10), Medium (Men's 9-11 / Women's 10-12), and Large (Men's 11-13 / Women's 12-14). If you have any questions about this product by OTC, contact us by completing and submitting the form below. If you are looking for a specif part number, please include it with your message.